The 2017 Inbeon Con is being held this weekend at the Melville Marriot in Melville, New York (Long Island), and I’ll be returning for (technically) the third year in a row. (I write technically, because my first appearance was at their Winter show, which is no longer running). Also worth mentioning is that there are only nine days remaining to get your name to appear in both my upcoming sketchbook and the second collection of Gentleman Cthulhu comics (due out this Fall). First, I’ve enjoyed doing Inbeon Con since I started attending and not least because Eric Hutchison (Inbeon’s owner and one of its contributing creators) is a long-time friend of mine—in fact we first met at my first Baltimore Comic-Con which is coming up next month. It’s a small show, but well run, as is everything Mr. Hutchison does. He and his team at Inbeon Studios have a lot of passion and focus with everything they put their mind too (people could learn a lot from this crew). So, if you’re able to make it out to Long Island or in the area and would like to attend a smaller, slower paced show than the massive comic cons out there (though the show has a long list of creators and panels), and one which focuses more on independent creators, consider coming out for this one. It’s sure not to disappoint. 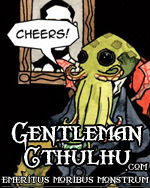 $3.00 – Your name in both books and a digital copy of the second Gentleman Cthulhu collection. On Patreon, you also get early access to all Gentleman Cthulhu comics at this level and above. $5.00 – Your name in both books, a digital copy of the sketchbook and a print copy of the second Gentleman Cthulhu collection. $15.00 and up – Your name in both books and print copies of both the sketchbook and the second Gentleman Cthulhu collection. Again the deadline is August 31, so make sure you get your name in using one of the above methods on or before that date. There will be no extensions this time (I did extend the date twice before, but this is the hard deadline). Books will be mailed in October following New York Comic Con, or you can pick them up either at the Baltimore Comic-Con (September) or NYCC (October).